For the iako, I had two photographs I had taken, one from 2002 when the deck was narrower and the iako therefore smaller. 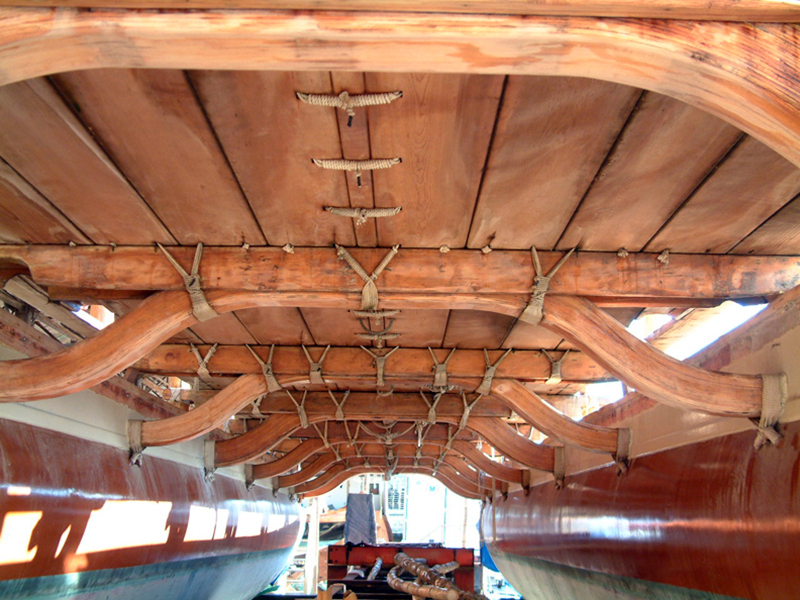 But at least this shows the shape and the support for the deck. 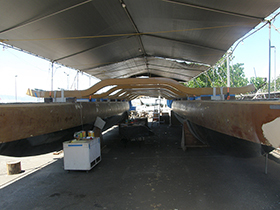 The other photo, from 2011, shows the canoe under construction with the new and longer iako, but no deck supports. I made a template that included both iako and deck support, then did my best to match the size to 48" hulls. I used oak because I figured these had to be very strong—they do hold the canoe together, after all. Hokulea under construction, 2011, with new and wider iako. 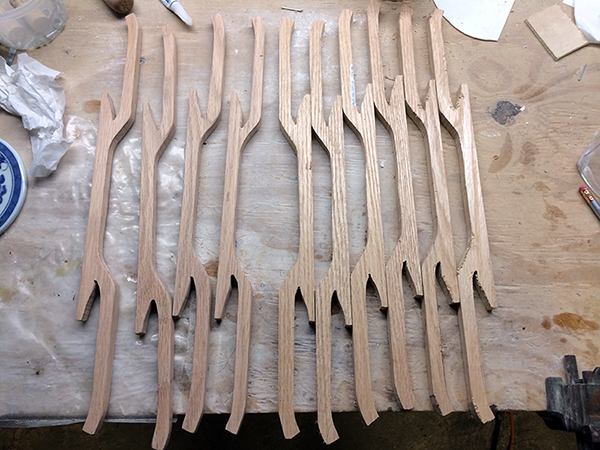 Here are my iako, nicely sanded (left) and awaiting sanding, right. For reasons that now escape me, I also engraved these with roman numerals, 1-8 (I made ten, turned out I only needed eight, but those spares came in handy!). 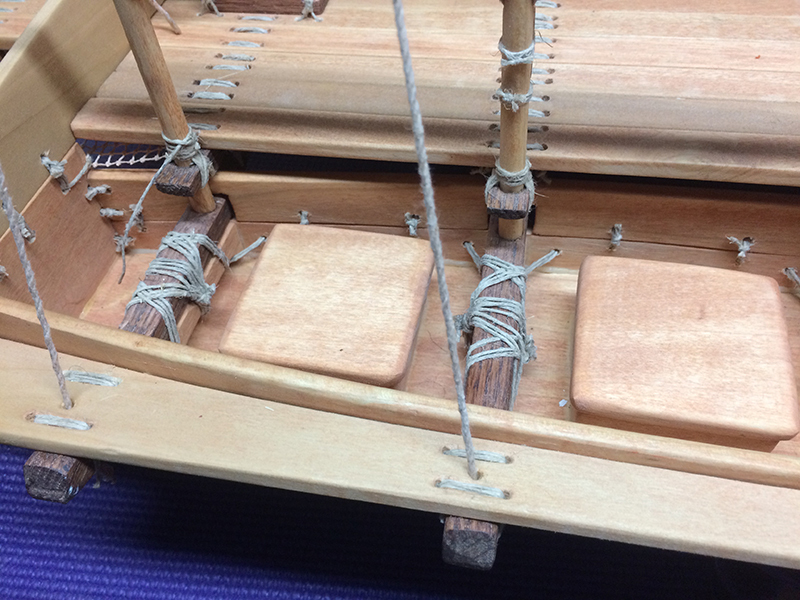 As I started to think about lashing the decks to these, I realized that I was going to have to get my lashing needle through where the lashing went around the deck-support part of the iako. So I took a small scoop-chisel and carefully carved a groove on each side of the deck support. This made the lashing much easier. I had already made the sides of the decks. These are pieces of poplar that I bent (using boiling water, if I recall correctly) to fit along the outsides of the decks, then carefully carved out the holes through which the iako would pass. I knew the trick was going to be getting the curvediako through these tight holes, so I did that before gluing the sides to the deck itself. Then I glued them to the decks. 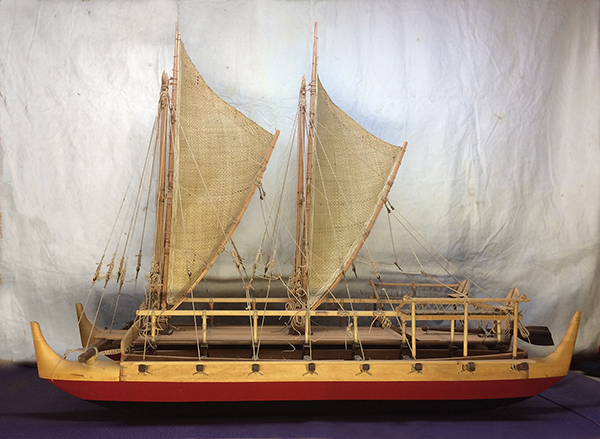 These add extra width needed, as the upper sections of Hokulea protrude a bit beyond the tops of the hulls, as you can sort of see here. The catwalk then sits on those ends. After it was all glued, I had—too late—a realization. As much as I had appreciated the bare wood from which the model was coming together, it would really look better stained. And stained in different colors for the different types of wood. 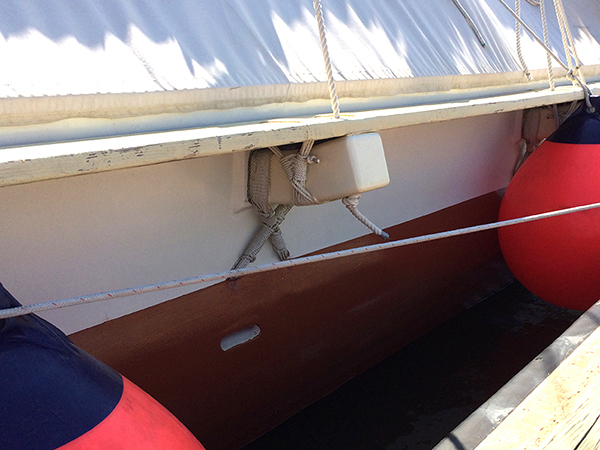 Dark for the iako, lighter for the decks and hatches etc. Problem was, there was no way to stain them separately now that I had glued it all together. 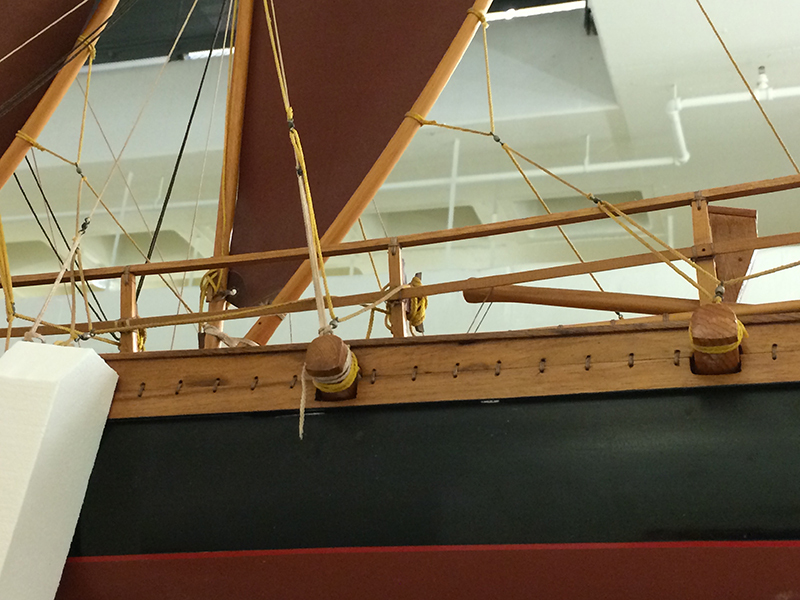 Then I looked at photos I had taken of the model in the NMAI collection, and saw that the sides of that were actually two pieces, stitched together. How much simpler that would have been! After much desperate searching for alternatives, I got out my Dremel and a little circular-saw bit and carefully cut in half the sides facing the center of the canoe. I needed do only this one side to get the iako out. Then I stained everything, and stitched the half-sides back into place. Frankly, I really like the effect! But what a hassle. At least, it was my first round of trying to lash anything together on this model. 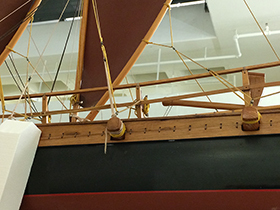 Stitched sides of the NMAI model. 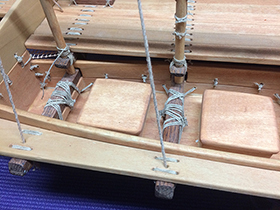 One inside side of my deck, showing bow I cut it in half to remove the iako, then stitched it back together. Now to take care of the lashing.